You know how the father on My Big, Fat Greek Wedding uses Windex as a cure-all? I've got a couple of similar tricks up my sleeve and one of them is Vaseline. I use it as a one-trick-wonder and always have some in my home. Squeaky doors. I apply some Vaseline with a Q-tip and let it set for a couple of days - sure enough, the squeak disappears. I've used this on car doors, screen doors, bathroom doors, you get the point. Works every time. Makeup Remover. I used to cake on the makeup for show choir and other shows in general. Whenever I had stubborn stuff that I thought would need chiseled, I busted out the Vaseline and simply wiped it off. I swipe a little on my lashes before bed each night instead of scrubbing them to death and when I awake in the morning - voila! No sticky mascara residue! Lip Balm. Chapped lips? 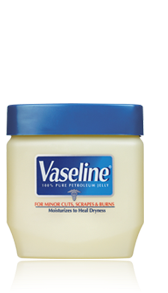 Vaseline will always keep them moist, healthy, and shiny. Salve for cracked skin on hands and feet. I have great hand/feet skin, I really do. But on the rare occasion that something gets too raw, I slather on some Vaseline before bed and cover up with gloves or socks (or both) and wake up in the morning to silky smooth, saved skin. Now you want to go buy some Vaseline, don't you?